I was supposed to mention your names on the show this week, but I forgot. I hope this makes it up to you. *sniff* All right, bring it in. Group hug. 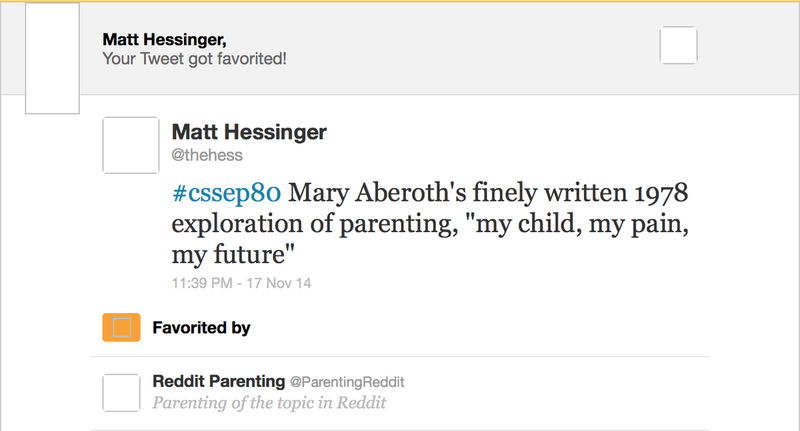 Kris – As punishment, you have to open the show with a reprise of Mary Aberoth discussing her pending lawsuit from the followers of @RedditParenting. Seriously, we got to play along on the hangout – that was totally worth it. Edit – Duh, I just noticed that you actually recorded a touching message to us. Do I have to patronize twice, since you and Mikey both pronounce my name two different ways every time? Please never ever find out how to properly say Hessinger. "They accidentally pronounced his name twice, so now he's Two Patrons." Maybe it's just me, but isn't the music for this video very, extremely, Ice-Ice-Baby-level "influenced" by Mikey's Chainsaws of Love song?